Graduation gifts, Swiss watches. 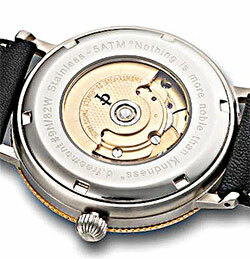 Collectable limited production mechanical watches. Buy factory direct. Truly a stunning conversation piece, Voyager features the ETA Elaboree 25 jewel automatic movement - shock protected, water resistant to 5 ATM, Sapphire crystal, white or parchment colored dial and stainless steel or 18kt Platt gold bezel. "Nothing is more noble than kindness"
d.freemont, the Albatross and "Rhyme of the Ancyent Marinere"
The Albatross is featured on nearly all d.freemont watches… It was taken from the “Rhyme of the Ancyent Marinere”, an epic poem by Samuel Colridge, wherein Coleridge shows the folly of mankind under the influence of superstition. 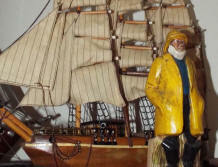 The poem tells of a sea voyage around South America in a 19th century sailing ship…The crew began to debate and argue about the presence of an Albatross that was following the ship. Many of the seamen spoke of the curse of such a bird, while others clung to the ideal that the bird was a mascot of good luck and smooth sailing… However, the Ancient Marinere, leader of the superstitious crew, shot the bird with a cross-bow. The cruel weather of the south Atlantic with turbulent water and winds proved to support the notion that the Albatross was indeed a bad omen. After the slaughter, the weather turned less hostile and the ship began the upward tack into the South Pacific. Agreement spread among the crew that the bird nearly cost them their lives and the ship itself justified the slaughter. Now, as the Ship and crew enter the more pleasant waters of the Pacific, a reversal of opinion stalks the crew. The wind stops and a calm and silence drift the ship into a dead doldrum. Anger swarms around the Ancyent Marinere for slaughtering the Albatross. Now considered a good omen, the hostile crew tied the dead bird around the Ancyent Marinere’s neck. As the doldrum persists, all the crew does perish, except for the Ancient Marniere who moans the immortal lines, “Water,water everywhere and not a drop to drink”. The poem ends with The Ancyent Marinere’s salvation and divine rescue as he professes to all that will listen - that it is man’s purpose to be kind to man, beast and bird alike. 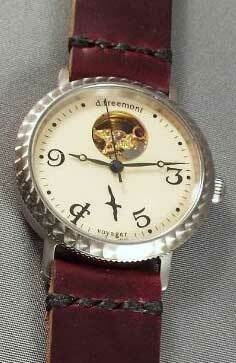 d.freemont believes this to be the noblest calling of man… so he repeats the Albatross image on his watches to reinforce the message time after time. The last 22 renditions of the famous d.freemont Ancyent Marinere series. "My compliments on yet another stunning time piece (Voyager). It was well worth the wait. I particularly love the contrast between the sumptuous mocha dial, the jet black of the hands and markers, offset by the lustrous steely glow of the engine turned bezel. Really stunning. And the dark brown ostrich strap is the perfect compliment, I'm so glad I chose it. Of course, the glimpse of the watch's internal 'beating heart' - ringed with gold - really makes it an eye stopper. The teak wood gift box is the perfect housing for this varied and stunning collection. A cherished collector set!